Smithsonian magazine’s Museum Day Live! Admission is free with a Museum Day Live! ticket. On Saturday, September 22, The Historic New Orleans Collection will be among 25 Louisiana museums participating in Smithsonian magazine’s Museum Day Live! 2018, offering free admission to anyone who downloads an online ticket. An annual celebration of culture, learning and the dissemination of knowledge, Museum Day Live! reflects the spirit of the Smithsonian and emulates the free-admission policy of its Washington, D.C.–based facilities. Participating museums and cultural institutions nationwide will open their doors to Museum Day ticket holders free of charge for a day, encouraging support of these important educational centers. Museum Day 2018 will showcase Women Making History: Trailblazers in the Arts, Sciences, Innovation and Culture. As a Museum Day Live! 2018 participant, THNOC will offer ticket holders free guided tours of the Williams Residence Tour or Louisiana History Galleries or the Architecture and Courtyards Tour. The offer is good for only one tour, all of which are offered at 533 Royal Street. The Williams Residence showcases the elegant French Quarter home of THNOC’s founders, General L. Kemper and Leila Williams, who purchased the 1889 two-story townhome in the late 1930s and furnished it with items from their world travels. Offered at 10 a.m., 11 a.m., 2 p.m., and 3 p.m. The Architecture and Courtyards Tour uses the seven historical structures that make up The Collection’s Royal Street complex to illustrate the numerous architectural styles seen throughout the Vieux Carré, including a Creole Cottage, an American side-hall townhome, and a Creole-Italianate townhome and three private courtyards. Offered at 10 a.m., 11 a.m., 2 p.m., and 3 p.m. The Louisiana History Galleries present a chronological narrative of the state’s history, from pre-colonial days through modern times, utilizing items from THNOC’s permanent collection. Offered at 11 a.m. and 2 p.m. 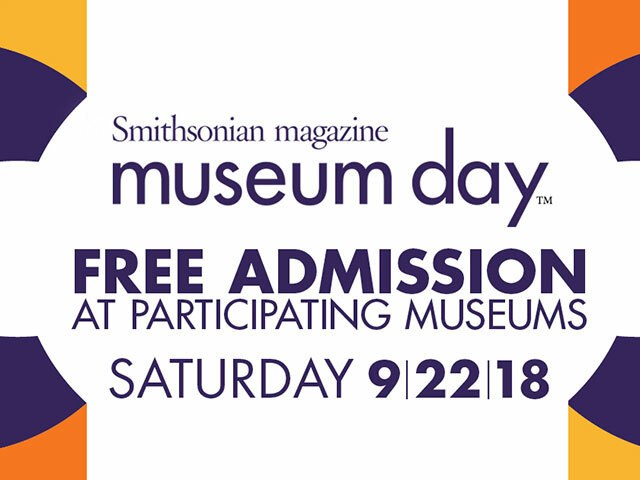 Fill out the simple online form to download your official Museum Day Live! 2018 ticket at www.smithsonian.com/museumday. One ticket provides museum access for two people to one participating institution. Only one admission card is permitted per household. Only an official Museum Day ticket is eligible for free entry, and attendees must present the ticket upon arrival to gain free entry.